In summer, brakes on dry roads like a summer tyre. 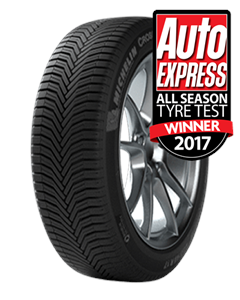 Provides excellent grip on wet roads in every weather condition, in summer and winter. In winter, is approved for use in snow. Lasts even longer than Michelin Energy Saver+, best-in-class in its Summer Category. The grip-maximizing compound provides flexibility to enable indentation in the ground, whatever the temperature. Rigid and bevel-edged tread block design improves dry braking performance. The unique V-shaped and lasting tread pattern maximizes the clawing effect on snow from the 1st to the last mile. High rigidity of the tread pattern optimizes the longevity performance. The 3D sipes are full-depth for long-lasting mobility on snow and self-locking for effective dry grip. As the tyre wears, emerging grooves open to deliver long-lasting traction on snowy roads.